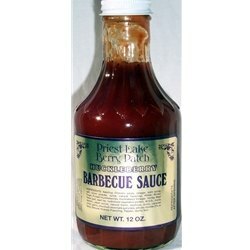 Ingredients: Tomato paste, vinegar, corn syrup, salt, onion powder, spice, natural flavoring, Beef Base, Water, Brown Sugar, Huckleberries, Huckleberry Vinegar, Honey, Natural Hickory Flavor, Pepper, Garlic Salt 12 oz. This is great on chicken, pork and more. It is a great dip as well. 12 oz.